A Facebook friend stated in her status yesterday that she was pondering the fact that there are different denominations such as Lutheran, Baptist, Catholic etc and wondered aren't we all Christians and followers of Christ. The responses were basically along the lines of yes, as long as Christ is the foundation that is all that is important and "all the other religious stuff is just stuff." Well, yes, that is true to a point. Yes, Jesus is the foundation but by no means is He all that is important and all that other religious stuff is not just stuff. If you went to church thinking that it does not matter where you go or that everything is the same you could be led down the wrong road and end up someplace like the Westboro Baptist Church. I don't think anyone here wants to end up being led by Fred Phelps. Obviously, the idea that you would end up protesting and saying horrible things is the extreme but is meant to be an example that a person should be vigilant in looking for a church to attend. No one wants to be led astray and everyone, I think in the end, is looking for truth. The problem is that in society truth seems to be subjective when it is objective. There can only be one truth and the truth does not change. We must search for the truth even if we may not understand or even fully agree. That is why we have over 30,000 different protestant denominations today--people are looking at truth in a subjective way, as if it can change to fit society and fit their needs. God wouldn't do this to us. He wouldn't leave us rudderless. That is why Jesus established a church, gave it authority, a heiarchy and a form of succession. This apostolicstic succession has lasted for 2000 years. As to the second argument that all that other religious stuff is just stuff. It is true that in the end the music, the architecture, even great preaching does not matter. But the sacraments---those physical ways that God gives us grace are much more than just stuff. Baptism, confirmation, the Eucharist---they are much more than just symbols. Marriage and ordination are more than temporary life decisions. They are amazing gifts given to us by God to help us through life and should not be easily dismissed! I've had difficulty writing this. I think I've tried being too politically correct and not ruffle any feathers. But all of the Christian churches aren't the same. If they were they would not have broken off from the other and they would look exactly the same. I do know that Jesus hoped that we would all be one though and I do know that He only established one church. I also know that if I didn't believe that the Catholic Church was that church or that it did not contain the truth and have the fullness of faith that I would be looking for the one that did. "people are looking at truth in a subjective way, as if it can change to fit society and fit their needs." I agree. Especially to fit their needs. They'll even start churches. My mom's pastor started his church because of a disagreement with his previous church politics. Of course, it's probably for the better in his case, because (I've gone quite a bit with my parents) many of his views are surprisingly Catholic (except prayer to saints, eucharist, marian). They just finished a series on "Faith without works is dead." Which surprised me, that whole "we don't work our way to be saved" mumbo-jumbo that gets thrown about. 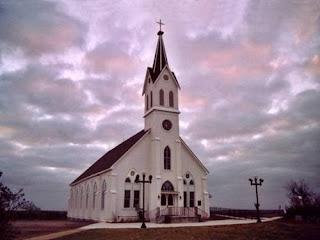 But my father, former-Catholic, likes to church-hop, and located this church, get's into heated disagreements with the pastor (who loves this sort of stuff). At home, Dad will argue that it's "The Gospel according to Kevin" (the pastor). Or "The Gospel according to Doug" (a teacher and helper their). Dad will never admit to it, because in his mind he's following what the Bible says, but he's looking for The Gospel according to Vincent (his name). You are totally correct and thank you for a great post.